David Gregory is a good guy. He does many things in broadcasting very well, but the audience is the ultimate arbiter… and the audience has clearly spoken. Some are arguing for a swap of NBC’s Chuck Todd as anchor. That may be worth a try. On recent Sunday mornings I find myself more drawn to Bob Schieffer on CBS’s Face The Nation. Schieffer wields his gravitas in a way that says he is not trying to curry favor with anyone. His blunt questioning and bold commentaries are refreshing. Does NBC have someone like this they can plug into MTP? Tom Brokaw’s stint as Meet The Press anchor following the death of Tim Russert was lackluster. Brokaw seems more a creature of New York than Schieffer and his “I-have-seen-it-all-in-DC, don’t-try-to-buffalo-me” attitude. Andrea Mitchell? Joe Scarborough? Chris Matthews? Rachel Maddow? Jim Miklaszewski? Ann Curry? Peter Alexander? Savannah Guthrie? Pete Williams? Kelly O’Donnell? Willie Geist? Luke Russert? I am not sure any of them are answer. Can NBC recruit someone from outside? I think Bob Woodruff is under-utilized at ABC News and has all the makings of a good Sunday morning anchor. Judy Woodruff might also be an interesting choice. Perhaps NBC could cut a deal where she remains as anchor of PBS Newshour and also takes on the MTP role? The same could apply to Gwen Ifill. Ray Suarez is a thoughtful, independent minded journalist who would bring a sizable number of his fans to the show. Speaking of PBS-types, Hari Sreenivasan would bring great social media skills to the MTP anchor chair. There are many options for NBC, but they don’t seem to be looking for an answer. 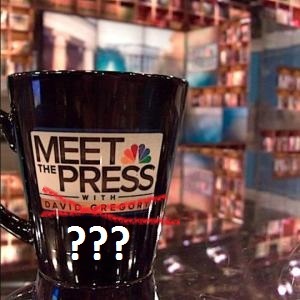 Until changes are made, I won’t have much more to say about Meet The Press.